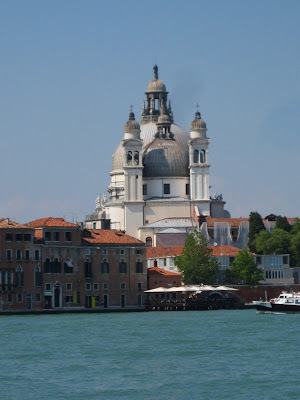 Texas Tales: Italian Adventure Part III: VENICE! It's hard to fathom a city built on water until, well, you see a city built on water. Which is exactly what we stumbled out onto when we finally managed to kerplunk our suitcases out of the Venice train station. Venezia, as the Italians say, is truly a unique specimen. Especially because there are very few cars, which you only realize after you've been riding to and from on a boat for 24 hours and it finally occurs to you there's no excess of brake lights or the sounds of exhaust pipes puttering about. Just pedestrians and waterways and walkways. And gurgling boats criscrossing each other around the canals along invisible, intertwining "lanes." St. Mark's Basilica dominates the Venetian skyline. Beautiful as it all was, Venice was probably the most difficult city to manuever on our Italian Adventure. We had to cram our suitcases down into the seating area of a little water bus, which involved hoisting the darn things down more stairs into the lower part of the boat where passenger seats and the teeniest tiniest luggage storage were. Do this a few times and see if you're not rolling in sweat when it's all over! But after we chucked our luggage at the hotel, and were able to travel lightweight, it was a lot more bearable. A water bus pulling up to a floating station. Sans baggage and ready to explore! Husband riding on a water bus. 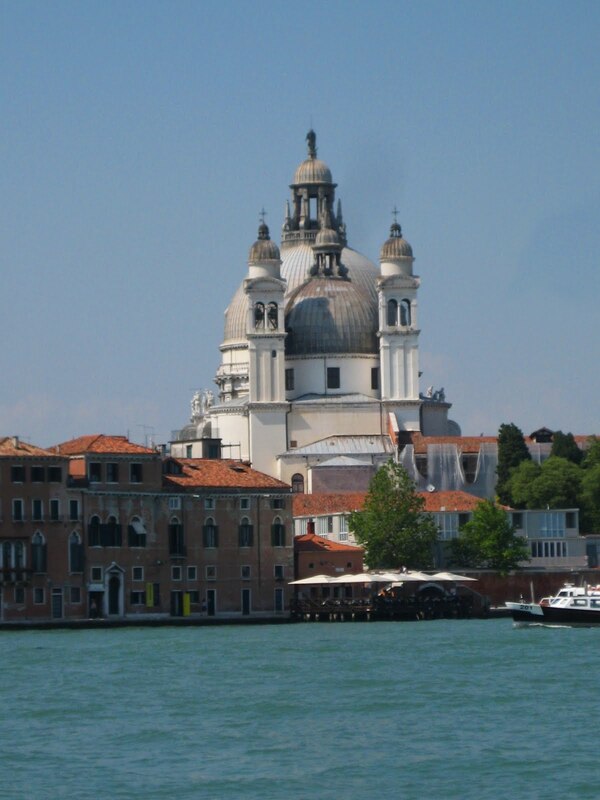 We chose a hotel on a separate island called Giudecca, just across the grand canal of Venice. It was small and hidden on the backside of a large set of buildings, and down a narrow alley. Which was actually a street with a name and everything. Only we seriously thought it was just an alley because we rolled past it back and forth several times after disembarking the boat in search of the place. Just goes to show you that space counts here! For our stay in Venezia, we wanted to experience the culture and life on the water more than sightseeing and landmarks. So we hit a couple highlights and left the rest to chance. The afternoon we arrived, we headed over to St. Mark's Basilica for a quick look inside. Yet another impressive Italian church! To set it apart from the several we'd seen during our trip already, here's a little history nugget: it was built sometime around 1094 and is a powerful example of Byzantine architecture. Lots of gilding, gold and such. Just lovely. After that, we meandered around for a little bit and happened upon the Hard Rock - score! It was nestled on the perfect Venetian street corner of Gondola Town and Chic Italian Buildings. Okay, so I made those names up, but it really was the most ideal spot to be. From our cocktail table on the Hard Rock's first floor, we sipped on a couple drinks while watching the tourists claim their gondolas and shove out into the water for a tour around the canals. It was so perfect, in fact, that we drained our cups and walked over to partake after a quick trip to the ATM. Except we didn't even make it to the ATM since I realized with a groan that I'd switched purses at the hotel earlier, and didn't have any of my credit or bank cards. So we had to grudgingly hike back to Giudecca island (which involves a good bit of walking and two boat rides) to pick up our credit cards then discovered that none of the ATM machines were still open. We ended up eating dinner at an outdoor cafe on our side of town and watched the sunset. After a glass of wine, I'd gotten over most of my grumpiness and was able to enjoy our pasta and grilled vegetables. The water in the canals had risen some as the day worn on, and several waves managed to slop over the edge of the sidewalk, drenching the feet of diners on its edge. I can totally see how Venice can easily flood during high tide! The ground floors of most buildings don't contain anything too important in order to accomodate the floods that are a part of daily life when in season. You can see the old water lines from when the canals run high. 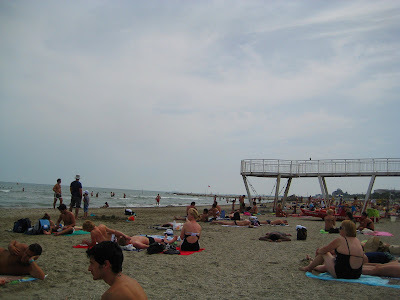 Our second day in Venice involved some scheduled beach time, which I was more than ready for, so we hopped on a water bus to Lido island and hoofed it to their free public beach. Which apparently observes toplessness at will, 'cause we may have seen a few! Other than that, though, it was a wonderfully uneventful relaxing day at the ocean. We even managed to gather up a couple handfuls of shells to bring back as a memento and now have displayed in an old glass pickle jar. Since we'd only had drinks at the Hard Rock the night before, we decided to head back there for a nice dinner. And boy, did we eat it up! We ordered nachos for an appetizer - the first taste of anything close to authentic Tex Mex!! It was soooo good, with real sour cream and guacamole and everything. The restaurant also served a "fresh catch of the day," meaning whatever was freshest and most abundant at the local Venice fish market in the morning was cooked up and served by the chef that night. And it was delicious. After eating more food than I should have possibly been able to fit in my stomach dinner, we drifted over to the gondola station just outside the eatery's front doors to hitch a ride 'round the canals. Except that it's 100 euros for a 45 minute float! Lucky us, three other fellow Americans walked up eyeing the expensive price tag so we all decided to split. Which comes in handy when you're wanting pictures of yourself on the gondola! It was so neat to see Venice from water level - we spotted the building used to film the opening scene in The Italian Job, Marco Polo's house, the Venice courthouse and beautiful Italian buildings fit for a postcard. 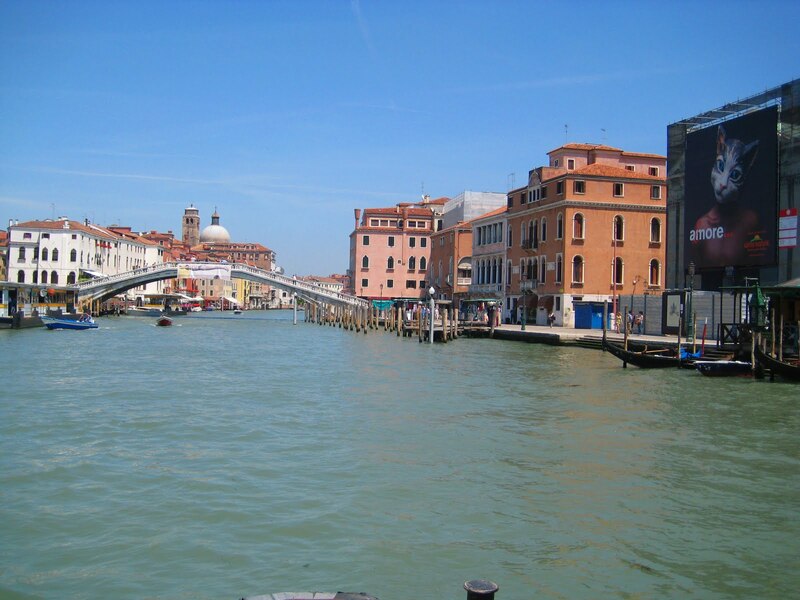 Rialto Bridge, one of four spanning the Grand Canal in Venice. This one is the oldest, completed in 1591. It was the husband's highlight of the trip. There's just something so surreal about standing on a bridge overlooking a water canal in Venice, watching the sunset while someone's guitar music floats out of their open window. Which is exactly what we did to close our stay on the island. Some things are, indeed, better in person. Don't you agree? I have been watching for this post! It was an amazing adventure, was it not? I must say I think it was best that we (Louis Dean & I) enjoy it via you and Mike rather than in person and on our own! I loved the little video snapshot of Mike coming over the bridge by your hotel. I actually loved the whole thing and will come back and see it again and again! Thanks again for taking us along with you! So amazingly beautiful! I love that you guys went Hard Rock. Bobby always wants to go to Hard Rocks and Planet Hollywood's on vacation. Mom - it probably is a little easier this way!! Venice was so incredibly different. Stevy - Normally we wouldn't seek those places out, but this just happened by accident and we're so glad. Hard Rock was delicious. Some of the best food we've had in awhile, we miss American eating!